The great football coach Darrell Royal said, ‘Three things can happen when you pass the football, and two of them are bad.” The same holds true when complimenting your wife. Things can go badly very quickly if you aren’t totally on your game. I have been married almost 18 years AND have been the minority male in female circles for most of my life. I can’t say I understand women. That would be like saying I have expertise in astrophysics. My understanding of females is more basic. More like Newton’s law – action and reaction. The way to a husband’s heart is easy – Show up naked. Bring food. Women are more complex, and I have found they need lots of compliments. Not because they are narcissistic, but because it lets them know we love them. This seems simple enough, but it’s easy for guys to get confused and say the wrong thing. Here are a few of my guidelines. ALWAYS go with a high percentage compliment and work your way up (i.e. you look pretty today). Don’t make the mistake of going for the Hail Mary when attempting a compliment. So many guys try something like, “you’re makeup looks like you did a really good job today.” Pathetic. That is an interception. There is a reason the Doug Flutie Hail Mary is a highlight film classic – it’s dropped more often than it is caught! It is better to have a high completion rate than trying to play outside your game. Another guideline: don’t compliment other women more than you compliment your wife. Complimenting another women at a party more than you compliment your wife will only get you in trouble. They keep count, and so should you. Lastly, don’t say another woman is ‘hot’. This will get you in the most trouble. Trust me on this. There has been a guide swirling around the Internet called the Hormone Guide. 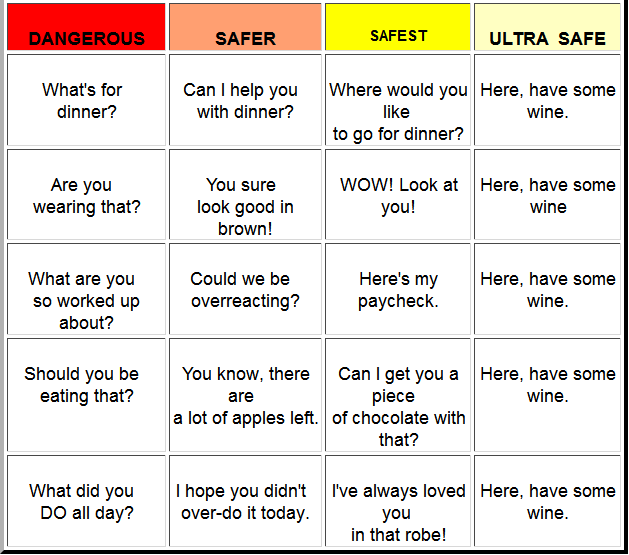 This is meant to help guys everywhere on what to say. It can be carried in a wallet or money clip. I think it is helpful to review before going home each day, so I have included it below. Please print it off and keep it handy. Also, be safe out there. It’s funny, but I don’t agree with the last column. I am not that into wine. :)) However, the rest of the table is sooo true. :)) Better stay on the safe side.